One of the things that kept me hooked to this series, whether the television adaptation or the original novels, is how every now and then these incredibly fleshed out characters will get these moments of clarity and tell it like it is. We got a little bit of that with Jaime last episode but I felt that this episode was almost filled to the brim with scenes like that. We got clear, enlightening looks into the headspace of some of the story’s most important characters all still pushing the plot towards this season’s tragic climax. There are also a number of changes to the original story that I remember, and it’ll be interesting to see how that Butterfly Effect manifests itself as the show goes on. Each change doesn’t seem like much in isolation but it could have some major ramifications down the line, especially since the source material hasn’t been completed just yet. After a few weeks of indifference towards Jon and Ygritte, I finally warmed up to their story which is ironic given that they spent the bulk of the episode climbing a block of ice. Rose Leslie has been turning in strong performances, but this week was the first time she really made me stop and take note of her performance. The simple acknowledgement that she knew Jon’s true alignment (which might or might not be a change from the books, I can’t remember) said more about her character than the whole cave scene last week, to me at least. The fact that she knows he’s probably going to betray them and is willing to believe in him anyway is both heart-warming and since I know how this is going to turn out, heart-breaking as well. The rest of Jon’s story is full of action sequences really, all building up to that great moment at the top of the Wall. It felt a little underwhelming to me though, probably because of how artificial and unrealistic it looked. Still, it was a compelling enough visual I guess, seeing them kiss on the top of the world. 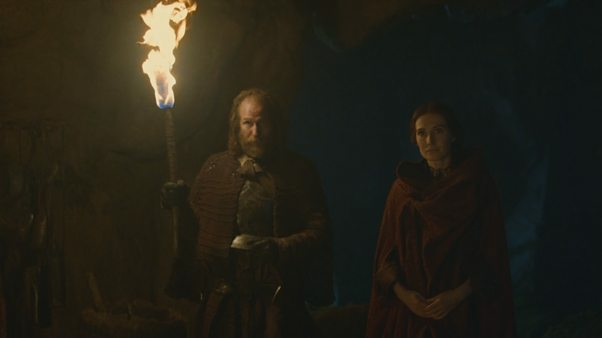 On the other hand, the scene with Melisandre visiting the Brotherhood felt really out of place, partially because it’s an adaptation original scene but also because it brings up a whole bunch of questions and is forcing me to address an issue that I was hoping we could put off till like Season 5. Is information from the show fully canon? If the show says that dragons can breathe underwater, do we accept that as fact, or is it true only within the show universe? Anyway, I think by this point, or soon enough, the show will begin to really branch off given the way that some characters are combined and others are omitted entirely. Plus, as new scenes are added the characters are forced to change to reflect the additional information and the additional encounters. 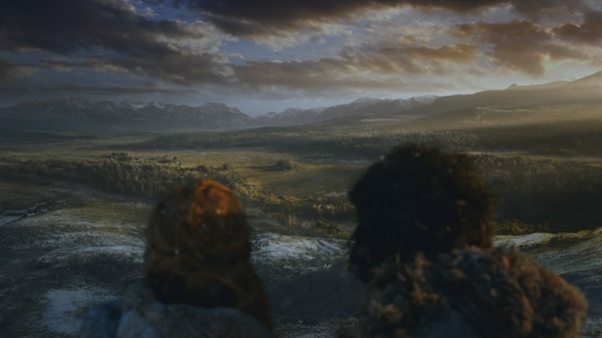 So, in this particular case, I’m going to gloss over the fact that there shouldn’t really be a way for Melisandre to find Thoros in the middle of nowhere but also that there was no need to drag Gendry off (seriously, why not try explaining to the boy why he’s needed instead of hauling him off like a criminal?). Instead, what does it mean when Melisandre says that she will meet Arya again? They definitely don’t meet in the books, so does that mean that they will also meet at some point in the books since I’m assuming that that second meeting promises to be more interesting than this one? Is Melisandre’s newfound knowledge of resurrection going to be of particular use to Jon Snow? Well, all the overall plot implications aside, I found this scene to be pretty sloppy, especially in an otherwise excellent episode. The whole ‘I sense darkness in you’ felt tacky and cheesy and Joe Dempsie (Gendry) yelling “We were supposed to be brothers!” didn’t really do it for me either. You win some, you lose some, I suppose. This episode definitely has more wins than losses though. 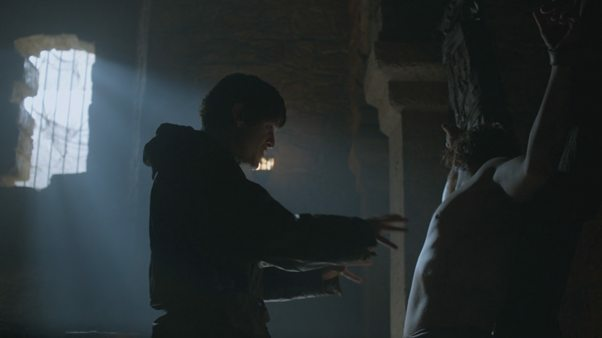 Iwan Rheon is threatening to steal all that acting thunder Alfie Allen has been building up over the course of the last season, because he is playing the sociopathic Ramsay Snow incredibly well. Despite my notoriously weak constitution, I’m actually looking forward to see Rheon torture Theon. There were strong showing from nearly every plot line; gotta love how Michael McElhatton (Roose Bolton) pointedly avoids hand-related puns around Jaime or how we see Robb talk about suffering from others’ sins. The prize though, has to go to Aidan Gillen and his speech on the nature of chaos. I don’t think the novel version of Littlefinger would be caught dead openly counting the swords in the Iron Throne but the action suits the HBO version of the character perfectly. The line about chaos being a ladder is essentially the motto of House Baelish and we see how he has risen on the backs of others. The bickering between Osha and Meera is just random and totally unnecessary though kind of entertaining. I hope there isn’t any actual conflict there; the drama would just feel very forced. Hilarious how uncomfortable Loras was around Sansa but the real gem was watching the Queen of Thorns needle Tywin about being bi-curious. I did not see that coming. Was Arya brief archery lesson a hint that we’ll be seeing more of it from her in future episodes? She is (and always will be, given the circumstances) a better shot than Bran. Why, exactly, did Joffrey kill Ros? I thought that the last few episodes were showing us how Margaery was slowly seducing Joffrey into being a better human being. Also, I wonder: was Joffrey even interesting in Ros sexually or did he just want a human target instead of rabbits?